Like any pursuit, genealogy has a language of its own. You might hear someone at your local genealogy society or a friend who’s been researching their family tree for decades refer to words or acronyms that make absolutely no sense to you. Confused? Here are a few common terms to help you navigate that genealogy jargon. 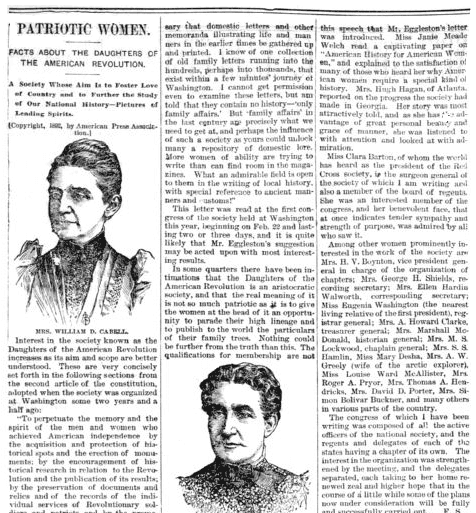 The American Genealogical Biographical Index is an index of millions of names found in genealogical and family history records. Original materials from the index are available from the Godfrey Memorial Library (as well as other places). This is an important resource for those researching early American ancestors. The Association of Professional Genealogists is “an international organization dedicated to supporting those engaged in the business of genealogy through advocacy, collaboration, education, and the promotion of high ethical standards.” Need someone to do a look-up or research where your ancestor lived? Consider an APG member. Do your future plans include a career in genealogy? Membership in APG is a great way to start. In the United States, we don’t typically refer to vital records as BMDs – but those familiar with English research are well acquainted with that term. BMDs are Birth, Marriage, and Death records. The Daughters of the American Revolution is a lineage membership society whose members can trace their heritage to someone who assisted in the cause for U.S. independence. The DAR has been around since 1890, and has since then counted 950,000 women as members. The Digital Public Library of America is a collaboration of institutions making their digital collections available to search in one online catalog. 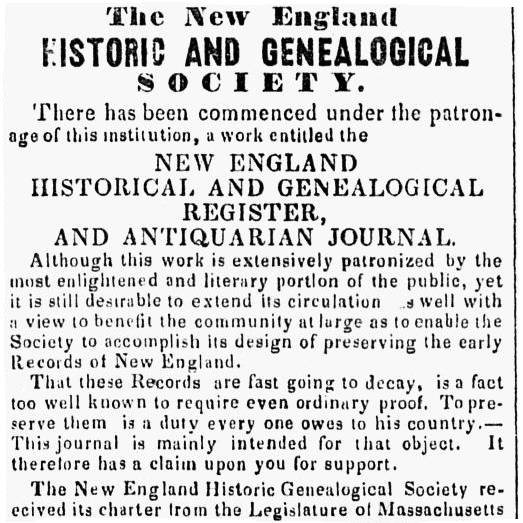 The Federation of Genealogical Societies is a society that provides resources to genealogy societies. One of their annual events is the FGS Conference. Have you been to the FHC? Maybe you’ve been to a FHC but not the FHL (see below). 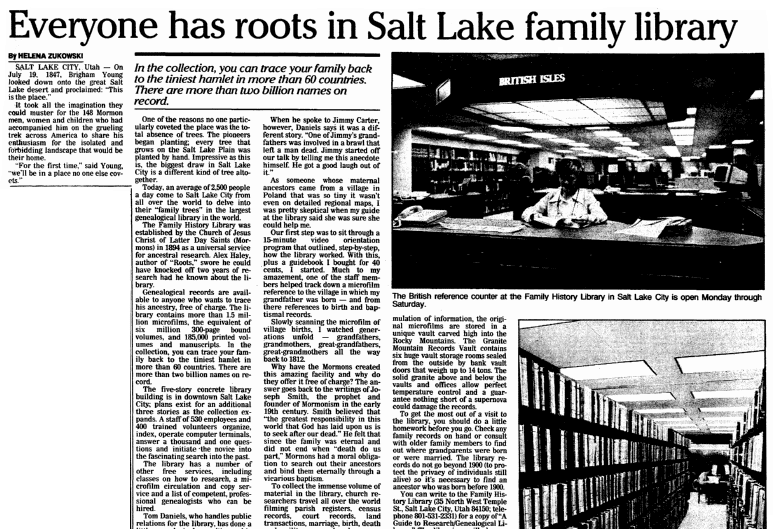 FHC is the acronym for the Family History Center, a branch library of the Family History Library in Salt Lake City, Utah. Most, but not all, Family History Centers are located in a Church of Jesus Christ of Latter-day Saints (Mormon) meeting house. In some cases, the Family History Center might be small, just a room with a few computers and a microfilm reader. In other cases, they may be larger, with books, space to work, and volunteers to assist you. Family History Centers provide patrons with access to paid subscription websites and a place to review microfilm ordered via FamilySearch. Have you been to the FHL? The Family History Library in Salt Lake City, Utah, is often a bucket list destination for genealogists and it’s easy to understand why. According to the FamilySearch website, the Library has: 2.4 million rolls of microfilmed genealogical records; 727,000 microfiche; 356,000 books, serials, and other formats; over 4,500 periodicals; and 3,725 electronic resources. If you are unable to get to the Family History Library, you can use some of their resources via the Records collection on FamilySearch or by ordering microforms (microfilm/microfiche) to be viewed at your local Family History Center. Sometimes you might hear someone refer to fiche as “fish,” but no matter how they pronounce it, fiche are small sheets of microfilm that contain images of documents, books, or other genealogically-relevant information. FamilySearch still has materials on fiche that can be ordered and sent to a Family History Center for viewing. The benefit of FamilySearch microfiche? Once they are at the Family History Center, they stay there, unlike microfilms, which are returned to the Family History Library unless they are on permanent loan. GEDCOM is the acronym for GEnealogical Data COMmunications. A Gedcom is a text file (.ged) that can be read by genealogy software programs, allowing you to export or import your family tree information easily between software programs or online family tree websites. GOONS is the acronym for the Guild of One-Name Studies. Guild members are those working on a one-name study of their ancestral surname or a surname of interest. The Library of Congress is the nation’s library and “is the largest library in the world, with millions of books, recordings, photographs, newspapers, maps and manuscripts in its collections.” Despite being located in Washington, D.C., you can access some of its vast collections through its digital collection website called American Memory. 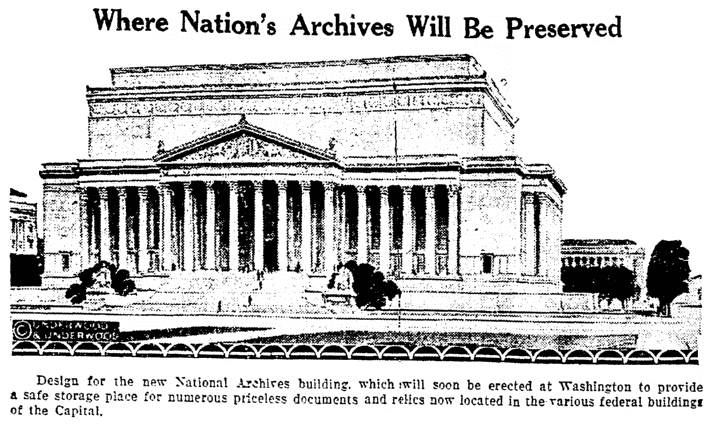 The acronym NARA, or sometimes referred to as the National Archives, is shorthand for the National Archives and Records Administration. NARA is the U.S. federal archive and is the curator of materials having to do with the federal government, like the census, some military records and pensions, and federal land records. NARA is an important resource and includes the archive in Washington, D.C., and regional offices throughout the United States. The mission of the National Genealogical Society is to “serve and grow the genealogical community by providing education and training, fostering increased quality and standards, and promoting access to and preservation of genealogical records.” Two of the ways they accomplish their mission is via a yearly conference and by producing publications. The word pedigree might remind you of a well-bred dog and its lineage, but a pedigree chart is the chart most genealogists use to show their own ancestral line. Pedigree charts show an individual’s direct line ancestors (father/mother, paternal grandparents, maternal grandparents, etc.). They do not show siblings, children, or aunts and uncles. These charts include information on the: birth date/place; marriage date/place; and death date/place of the individuals listed. Most pedigree charts show four to six generations, though you may create one that shows many more generations. The Periodical Source Index, or PERSI for short, is an index of genealogical and historical periodicals produced by Allen County Public Library. Now available through the Findmypast website, PERSI’s index is good for finding transcriptions, indexes, articles, and photos about genealogical topics and names. We don’t talk about Soundex as much anymore, but you may come across it when using an online genealogy website that allows you to use Soundex as a means to enhance your search of a surname. So, what is Soundex? Soundex is simply a coded index that takes into consideration how a surname sounds and not how it is spelled. Originally this code allowed researchers to find surnames even if they were not spelled “correctly.” Soundex was used in the 1930s to index some years of the U.S. Census. 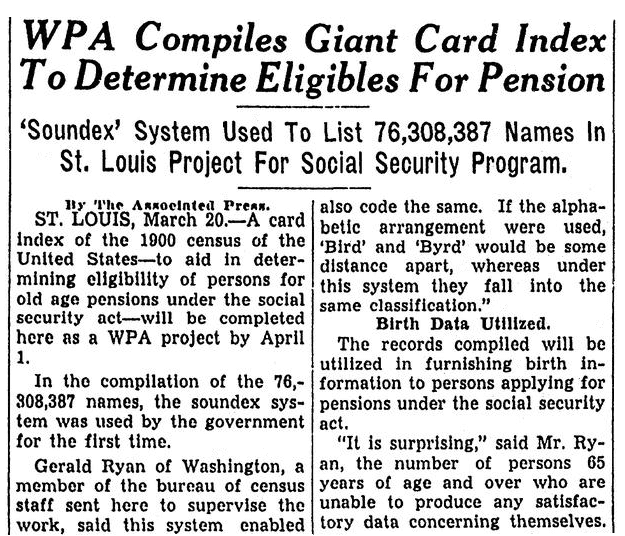 The 1900 U.S. Census was the first Soundex project taken on by the WPA (Works Progress Administration). * If you’re not familiar with the “look” of the Soundex code you can check out the web page Soundex System on the National Archives website. For those who’ve been researching their family tree for decades, you may be very familiar with the code for your own surnames and have used it to search the census. Are there more acronyms and genealogy-specific words and phrases? Yes, most every genealogy conference and society has a nickname or an acronym. In addition, there are acronyms used as shorthand for genealogy-specific events, places, and other words you may use in a family history narrative. Have you been perplexed by some of the above acronyms or genealingo? While this article provides a large list, there’s even more. What are some of the acronyms or words peculiar to genealogy that you have run into? Are you still perplexed about a term you’ve heard your family historian friends use? Tell us in the comments section below. * “The WPA Census Soundexing Projects,” Prologue Magazine (https://www.archives.gov/publications/prologue/2002/spring/soundex-projects.html: accessed 1 April 2017). Thank you Linda for taking the time to read it.